The maker of the Triangular and the 160mm TC knives produce a range of microscopy related products. We can supply these on request. A special cryo tungsten carbide knife is available for cryo applications. For ease of handling and use of the full 16mm edge length, the tungsten carbide blade is embedded in a steel holder. However, the two knives are interchangeable, both can be used in a cryostat or a rotary microtome. Improve section quality and save time with the DDK triangular tungsten carbide knife. 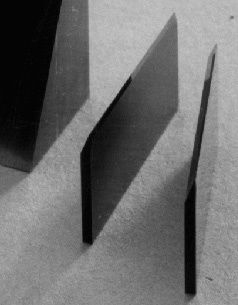 Having a consistent size and tip angle, these knives successfully replace glass and razor blades in a variety of sectioning and block facing applications. The sharp edge lasts through thousands of sections, eliminating mid-procedure knife changes and frequent reordering while enhancing productivity. These knives fit tightly in the glass knife holders of most microtomes, are easy to handle and reduce the risk of cuts to your hands. 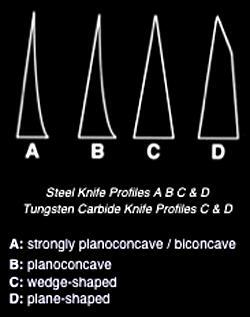 DDK's disposable tungsten carbide knives are used in plastic sectioning ‐ GMA and JB4 ‐ as well as for Epon and epoxy‐embedded tissue. Tungsten carbide is harder than steel and retains a superior edge after extensive use. The knives are made of 100% tungsten carbide. 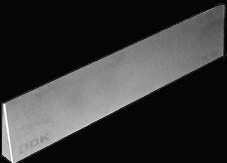 Note: These blades are similar to high profile blades in size, except that the thickness is 1.2mm. Please check if your microtome blade holder can accommodate 1.2mm blades. For other disposable histology blades and knife holders see page U1 ‐ our holder UYDBH‐170B takes these blades. For a heavy‐duty specimen like undecalified bone and very large specimens, a larger solid TC knife may be required ‐ see top of this page.